It's Blog of the Week time again, in which weekly a different blogger walks us through their Filofax blog. This week, it's Tracy who walks us through Crazy Suburban Mom. I used to do freelance (humor) writing, art, and cartoons but not recently; I think my primary reason for starting a blog was to get back into the habit of regular writing and being creative. It was a Retro Tuesday post I did a long time ago and I don't know why it was such a hit, it's like a lot of others I've done. I do a vintage image of the day now but I used to do them only on Tuesdays. 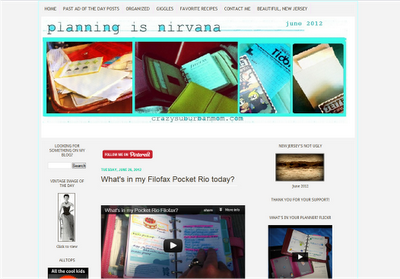 The Filofax post with the most views is Edward de Bono: On Filofax Hacks and it was about creativity and filofax hacks. I used to do posts for the now defunct New Jersey Moms Blog. I wrote a post for them called My kid's not going to college and it was picked up by their syndication group and reprinted in several news papers. A lot of things surprise me about it. Writing is so solitary and when you do it... Well, when I do it I feel like I'm in a vacuum; just me and my thoughts. On some level I realize I'm not just thinking but putting words out there for people to see but I'm always surprised that anyone else sees them. Still. I think organization is a very personal endeavor and a Filofax allows for any customization that helps you get where you want to go and allows you to go back and see how far you've come. I post about what worked for me, what didn't, and why. I didn't post about Filofaxes initially because I didn't think anyone would be interested in the odd stuff I ponder... Old rings vs. new rings, the varying size of front and backside pen loops, how you can stick a full Midori traveler's notebook in an A5 Finchley slot. Who cares, I thought. But a few months ago blogging didn't feel fun anymore and I wanted the fun back. Enter Filofax blogging... I found out if I care about something there's a good chance least one other person cares about it too and appreciates that I took the time to write it. It was a good lesson for me, so my advice is to write about what jazzes you and do it in a way only you can. My thanks to Tracy for participating.